This tutorial shows identification of material parameters of a composite structure using data (force-displacement curves) obtained by a standard tensile test. This RVE is used in the micromechanical FE analysis which is based on the two-scale homogenization method. Several carbon-expoxy specimens with different fiber orientations (0, 30, 60 and 90 degrees) were subjected to the tensile test in order to obtain force-elongation dependencies, see . The slopes of the linearized dependencies were used in an objective function of the identification process. 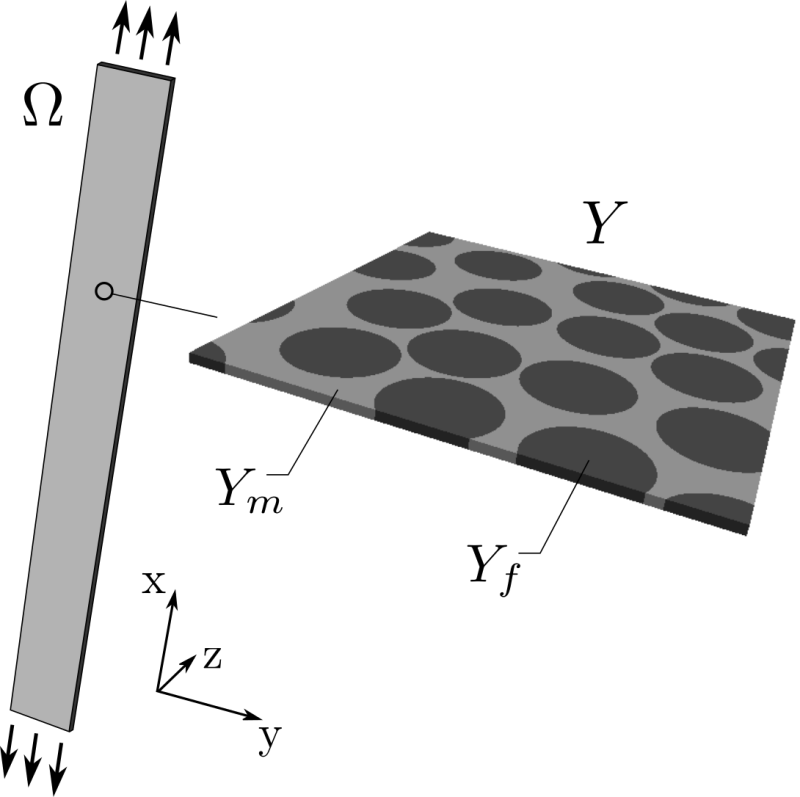 The linear isotropic material model is used for both components (fiber and matrix) of the composite so only four material parameters (Young’s modulus and Poisson’s ratio for each component) are necessary to fully describe the mechanical behavior of the structure. The numerical simulations of the tensile tests are based on the homogenization method applied to the linear elastic problem . The homogenization procedure results in the microscopic problem solved within the RVE and the macroscopic problem that involves the homogenized elastic coefficients. The problem at the microscopic level is formulated in terms of characteristic response functions and its solution is used to evaluate the homogenized elasticity tensor. The microscopic problem has to be solved with the periodic boundary conditions. The following SfePy description file is used for definition of the microscopic problem: homogenization_opt.py. In the case of the identification process function get_mat() obtains the material parameters (Young’s modules, Poisson’s ratios) from the outer identification loop. Otherwise these parameters are given by values. 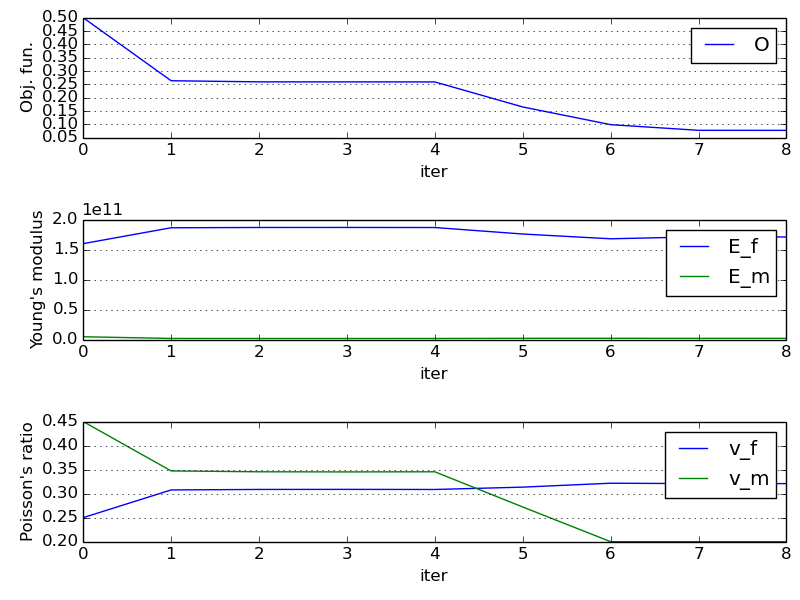 Notice the use of parametric_hook (Miscellaneous) to pass around the optimization parameters. 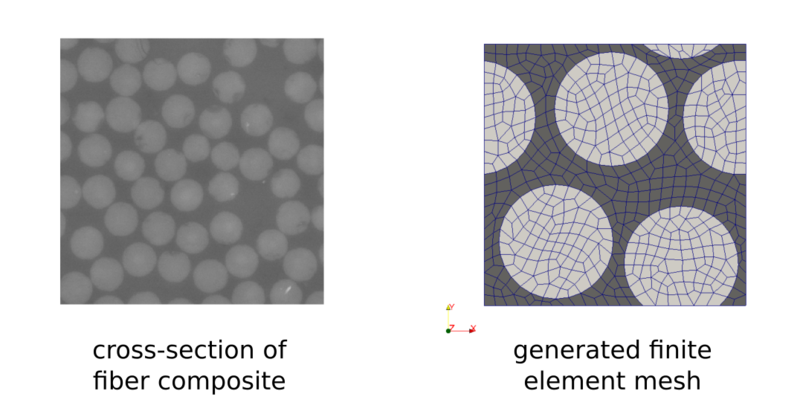 The homogenized elasticity problem is solved for the unknown macroscopic displacements and the elongation of the composite specimen is evaluated for a given loading. These values are used to determine the slopes of the calculated force-elongation dependencies which are required by the objective function. The SfePy description file for the macroscopic analysis: linear_elasticity_opt.py. where and are the computed and measured slopes of the force-elongation tangent lines for a given fiber orientation. This function is minimized using scipy.optimize.fmin_tnc() , considering bounds of the identified parameters. Solution of the microscopic problem, evaluation of the homogenized elasticity tensor. 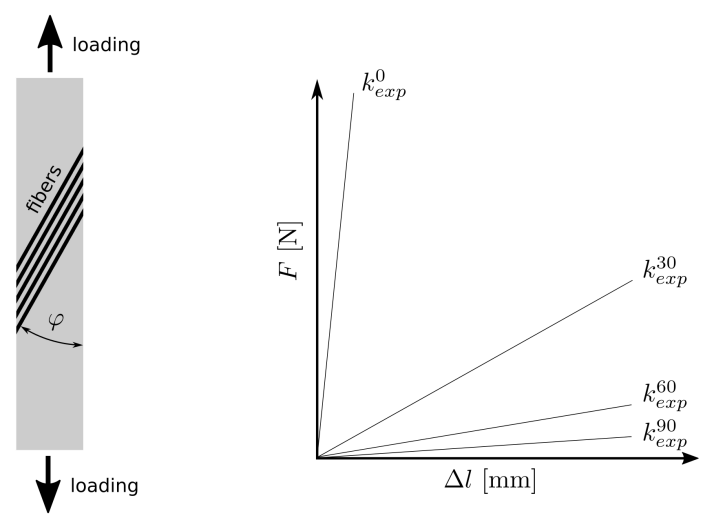 Solution of the macroscopic problems for different fiber orientations (0, 30, 60, 90), this is incorporated by appropriate rotation of the elasticity tensor. Evaluation of the objective function. Python script for material identification: material_opt.py. The iteration process is monitored using graphs where the values of the objective function and material parameters are plotted. Note: The results may vary across SciPy versions and related libraries. Srbová H., Kroupa T., Zemčík R., Identification of the Material Parameters of a Unidirectional Fiber Composite Using a Micromodel, Materiali in Tehnologije, 46(5), 2012, 431-434. Pinho-da-Cruz L., Oliveira J. A. and Teixeira-Dias F., Asymptotic homogenization in linear elasticity. Part I: Mathematical formulation and finite element modeling, Computational Materials Science, 45(4), 2009, 1073–1080.